I sat down and read Lois Lowry’s Newbery award winning The Giver for about the tenth time a couple of weeks ago. It is a classic dystopian favourite of mine that I often revisit because of its elegance, depth and creativity (if you haven’t read it, do!). Lowry herself has said that she would never write a story without hope, but every time I read it I am left wondering, if The Giver really has any. This time, after recently reading The Hunger Games and The Chaos Walking series’ I was really looking at the figures of authority and it dawned on me: what if the Giver really sent Jonas to his doom on purpose? When I proposed this to my creative writing class and I was met with general resistance – he’s such a sweet old man! but of course Jonas survives! the community obviously embraces the change! I just don’t see it as being that simple. So, naturally, I began to seek out how I could prove my point. What I found, and what I will share with you, is a tool that will help, not only to deconstruct beloved stories, but to aid in the creation of them. Abraham Maslow was a humanist psychologist. Humanists mainly focus on the potential of human beings: how people can meet that potential and why most of them don’t. Maslow proposed a hierarchy of needs as a motivational theory, which is his explanation for why we behave the way we do. Since the inception of this theory levels have been added to it and some changes have been made, but I’m going to keep it simple and focus on the original. Maslow argued that there is a hierarchy of needs, and when our needs aren’t being met we are motivated, or put into action, to succeed and attain our missing need. First are the physiological needs. The basics. Stuff we don’t even think about and often take for granted, and food and water which our lives revolve practically revolve around. Once you are fed (to a satisfactory degree) you begin to worry about safety. You look for shelter, gather resources, and seek to maintain the safety of yourself and immediate family; you feel safest when you are with them. This pours nicely into the next level – love and belonging. Now you start to look for a love relationship and for friends, community, a sense of belonging beyond the household. In the community of The Giver these needs are, or should be, 100% satisfied: “No one in the community was starving, had ever been starving, would ever be starving. To say “starving” was to speak a lie” (Lowry 70). Once these three ‘lower order’ needs are satisfied you become involved in esteem, which is the fourth level. Esteem is a higher order need, a cognitive need. One part is reputation – or what other people think of you, or really, what you think other people think of you. In The Giver, much like our own society, no one wants to be different or stand out. It is rude to point out difference and shame is felt when Jonas feels he has acted outside of the ‘norm’. The second part of esteem is self-respect, or what we think of ourselves and our internal environment or esteem. The citizens of the community are taught to feel good about themselves when they are productive and follow the rules. The simple sharing of feelings is supposed to lead to a feeling of ease within oneself, an example of how esteem is built in the community. Finally, we come to the top of the pyramid, to self-actualization. To find and do the one thing that inspires you the most, that triggers the creative or cognitive drive in you to problem solve, learn or create (it depends on the person. I strive to learn and am always looking for the next piece of trivia to devour). Self-actualization is finding and being able to actually do what you really want to do. For the members of The Giver community it is to become a productive member of society – to work for the greater good. But as writers and readers of fiction, keep in mind that the levels of the hierarchy are not fixed and can be played around with. Edward Cullen of the Twilight series, for instance, has an incredibly strong love/belonging level which is more important to him than even his most basic physiological needs. Is this believable? Draw a little triangle for yourself and chart the world of your story into it. Hopefully you will be inspired and forced to delve deeper into your world construction and justify why and how the world is the way it is. For the community of The Giver all of Maslow’s needs should be 100% satisfied for all of its citizens, and Lowry goes through 50 pages of exposition to describe how the community works: no one starves because of food crop efficiency, which meant controlling the weather, taking out environmental features like hills, which resulted in a lack of colour and a general sameness. Then of course, the complication, the motivation begins when the Giver begins giving and Jonas begins receiving not only memory, but knowledge. It is this very knowledge that drives the Giver to send Jonas off to his doom. The Giver, while being very honoured, does not have any power or any real use within the community. He knows how to make the community better but he is unheeded; he is not self-actualizing. The citizens don’t think of him or need him. He is certainly different because of his job and he is frustrated with the ignorance of the community citizens, so his esteem is also denied. He lives alone because he is older than all of his cohorts and his wife has already been “released”, leaving him with only Jonas as company. He knows that once his job is complete he will be released, and he knows that release is only death, so his safety and basic physiological needs are threatened as well. In order to take back the reigns of his own life he must send Jonas away so that memories are released into the community. In his mind he will then be assisting the community as the most useful and revered member of it, achieving not only self-actualization but esteem, a sense of belonging and utility and of course, saving himself (and the community) from release. This is a fun illustration of how Maslow’s hierarchy can be used not only as a deconstructive tool but also a constructive one. 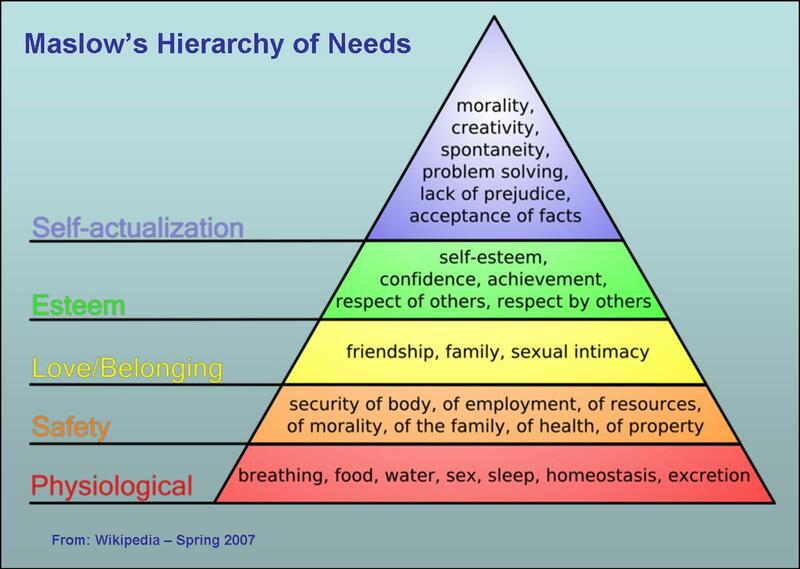 How does your character fit into the hierarchy of needs of your world? What will they do to achieve the next need? I think this is a useful and thought-provoking exercise for writers and readers alike. I hope you enjoyed! Keep coming back for our last week of Dystopia month! I’ll be posting in-retro reviews of dystopia books so check out the “Books We’ve Reviewed” page for more on dystopian books! Hintz, Carrie, and Elaine Ostry. “Interview with Lois Lowry: Author of The Giver.” Utopian and Dystopian Writing for Children and Young Adults. New York: Routledge, 2003. 196-99. Print. Collins, Suzanne. The Hunger Games Trilogy. New York: Harper Collins, 2007 – 2011. Ness, Patrick. The Chaos Walking Trilogy. Virginia: Candlewick Press, 2004 – 2010. “Maslow’s Hierarchy of Needs.” Wikipedia. Wikimedia Foundation, 08 Dec. 2012. Web. 10 Feb. 2013. Meyer, Stephenie. Twilight. New York: Little, Brown and, 2005 – 2010. Print.